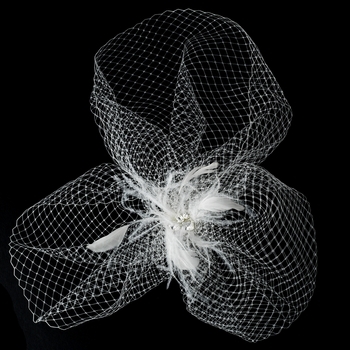 Modern and chic, this bridal feather fascinator features an ornament on either end of a nose-length birdcage veil. Simply beautiful, this piece is perfect for the modern bride, measuring 19" wide and 4" tall at the highest point. Both ornaments fasten in the back with a hair pin. 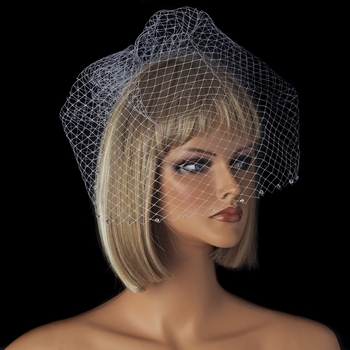 Simply breath taking, this couture feather fascinator and birdcage veil has a beautiful Rhinestone Jeweled Center Accent, with a spray of feathers. This piece is worn in the hair with a comb, for a secure and comfortable fit. Available in White or Ivory. Please choose color option above.